Beach, Golf, Water Sports, Restaurants, Shopping...the perfect OBX vacation! Enjoy both beautiful sunset views and easy access to the beach in this non-smoking, pet-free,sound-front home. The beach is a quick 5 minute trolly ride and it stops right in front of the house.And the beach is one of the few on the Outer Banks protected with a lifegaurd!!! The home rents from Saturday to Saturday. Included is a 14 x 28 in ground pool for your personal use. So if you don't want to use the beach front pools or the indoor pool at the recreation center across the street you now have the advantage of a private pool right out your back door. The home is beautifully decorated. From the Pirates room to the Margaritaville room, each bedroom has a special theme.There are 3 Bedrooms with private baths ( 2K,1Q ). 1 Bedroom with Queen bed and 1 bedroom with two Bunk Beds share a hall bath. Combined with one sleeper sofa this home comfortably accomodates 12 guests. You'll like preparing meals in the large, fully equipped kitchen. Enjoy the views of the sound while dining in the screen room. After dinner sit on the third floor deck,around the outdoor bar, to enjoy the spectacular sunsets while the kids have fun with the pool table, video games and TV in the first floor game room. Finish the evening off by relaxing in the hot tub.. The home is part of the Corolla Light planned community with multiple amenities including a beachfront pool club, multiple outdoor tennis courts,volleyball,basketball,shuffleboard courts and many planned activities. The sports center features an Olympic size indoor pool,fully equipped exercise room, along with handball & tennis courts. Both the sports center and sound-front pool are closeby... just a two to three minute walk! Whether you like to be active with sports, take in some serious sun at the beach, read a book on the deck or go shopping, this home provides is less than 10 minutes from everything. Spend a week here and you'll have a vacation of a lifetime! The view of the sound was amazing! Our grandchildren loved the decor. There was a pirate room with a treasure chest, a beach room with fake palm trees, parrots and monkeys, and model boats everywhere. There were lots of children’s games in the play room. However, the linens were thread bare and needed to be replaced. The mattresses were old and uncomfortable. Thank you for your feedback. Ellen and I take great pride in making our home a great vacation experience for our guests. Based on your comments we have already purchased some new mattresses. Unfortunately the linens are not within our control as they are supplied by rental management company. I will pass along your input and request they do better in the future. 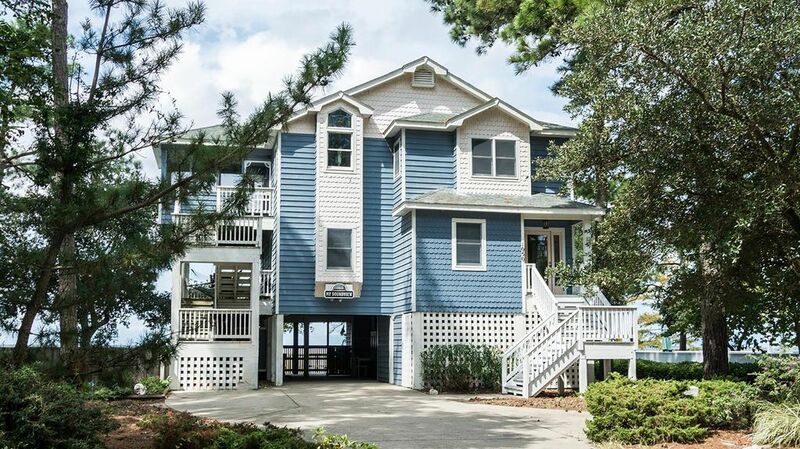 Soundview is a beautiful house and fit our needs for our vacation perfectly! The kitchen was well stocked with everything you could possibly need to cook and serve a fabulous meal. The multiple decks are great for relaxing and watching the sunset over the sound. The living areas are large, but cozy and are just right for relaxing after a busy day at the beach or exploring the Outer Banks. The bedrooms are comfortable and are decorated nicely. Bathrooms are clean and everything operated as expected. The pool and hot tub were wonderful for starting or finishing out the day. We even made use of the grill and patio dining areas two nights. We did have an issue with the air conditioning on the second floor, which required a part that took a few days to arrive, but the property managers brought in window units while they were waiting for it. Overall, we all highly recommend Soundview for an OBX vacation and will definitely stay again if we come back! Thank you for posting a review. We hope that the property management company was responsive to your maintenance issue. This is why I pay for someone locally to manage the property! We loved this home. Our family ranged in ages 2-65 and It fit all our needs. The pool is nice for relaxing and I loved the swing by the sound. The kitchen is amazingly stocked with everybitensil, dish and pan you could ever need. There is a fully stocked game and movie closet downstairs that we didn’t find until the day we left. The only thing I would change would be the latches on a few of the doors were not secure and having little ones we were very nervous about them having access to the pool. Registration was confusing as the house was listed with two businesses that did not work together. It caused a lot of frustration on our end and when it was said and done, we ended up paying $300 more than what it was listed with the other company. Being the first year with the new company, hopefully next year it willl be listed with only one group. Owner was easy to communicate with and very friendly ! First time renting a beach house. Elan serviced well. Lots of small issues with house (fridge with nasty rotten fish smell, screen door and DVD player broke) but overall a nice place. With these issues addressed would stay again. Right on the water made for amazing sunsets; lots of bugs as one might expect at the edge of a marsh. Enjoyed the hot tub and billiard table. We had an amazing time here, Thank You Richard! Glad to hear it...hope to have you as our guest again. This was our first trip to OBX and first time renting a vacation home. Both exceeded our expectations. Your home is lovely and the decor really sets the tone for a great beach vacation. There was ample room for our eight family members. There was plenty to do to keep the interests of the adults, the teens and younger child. There were so many extras in the house that we didn't expect, such as pool toys and floats, ample deck chairs and hammock swings, board games, bikes, Netflix, crab nets etc. All were well enjoyed. The private pool was awesome, and the sunsets over the sound were breathtaking. We enjoyed the Corolla Light pool and beach, but nothing could beat the 4WD beach and the wild horses. We'll certainly return to the outer banks in years to come, and wouldn't hestitate to return to My Sound View. Thank you for providing such a memorable vacation.